The worst natural disaster ever to hit North Dakota is now upon the citizens of this fine state. Home owners, businesses, schools, and churches have gathered together, forging a common brotherhood to meet adversity head on. 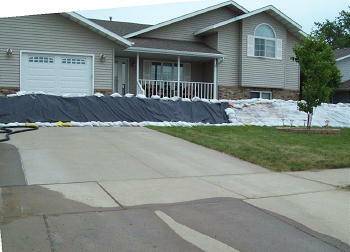 The fast-rising waters of the Missouri River are claiming properties as quickly as you can say “sandbag." 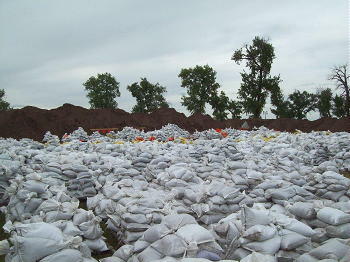 LifeNets North Dakota Chapter volunteers, Georgia and Colleen Faul, Herb Teitgen, Ralph, Pam and Britton Redline have been helping to make sandbags in effort to help their community “wage war on the waves” as the water levels continue to rise. These LifeNets volunteers homes are not in danger. Other efforts of these staff include assisting with the delivery and placement of the sandbags to residents in need, unloading the trucks, and helping build levies, dikes, and berms, around citizen’s homes. Moving furniture from homes, or helping to remove carpet from lower levels is another way they have assisted. LifeNets ND will donate $1000 to the relief efforts. My friend Carrie just sent me an email which reads: "Thank you to all of you who helped us move..... almost all our belongings..... out of our home. We couldn't have done it without each one of you. We are still battling water in our basement, but it nothing compared to the problems that others are having to deal with." Carrie is a personal friend of mine whom I met years ago. Her home is one of those directly affected by the flood. and, though I am sending you more pictures, this is a very good video that will give you details of the flooding so far. 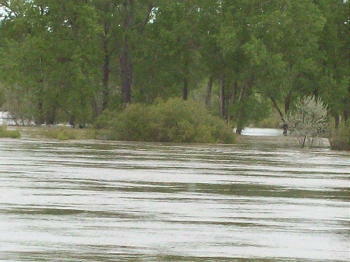 Hogue Island is on the northwest river bank of the Missouri, on the Bismarck side of the river. I have ridden my bike down in this beautiful area of the city when I was training for the LifeNets triathlon. It is shocking to see that the roads I have ridden on, no longer exist. LifeNets board member, Cheryl Glasser, and her family live in a potential flood area though, at this writing, they have moved their belongings to the top floors of the house for protection. Cheryl said their sump pump began moving water from their collection tank just last week. The basements and main floors of other homes, not in her region, have already been counted as a loss. Making sandbags, or “sandbagging” as it is referred to here (and shown on the right), involves one person shoveling sand into a bag, which a second person is holding open, ready to receive the sand. 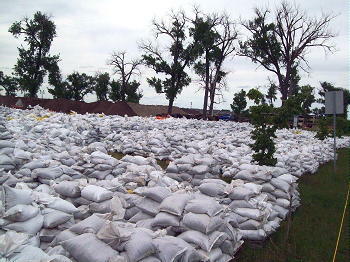 A third person is sometimes available to lift the sandbag out of the bag holder’s hand and move it to a common area to be placed with other sandbags. As trucks, trailers, and flatbeds move into place, another group of volunteers is available to pass the sandbags, “chain gang” style, to the last person in line who then loads the waiting vehicle. 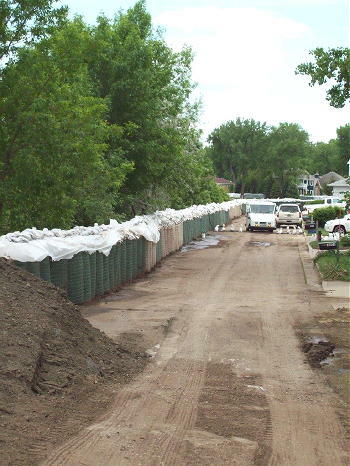 The “spider baggers” that are typically available in more flood prone areas, such as Fargo, North Dakota, did arrive in time to assist with the sandbag efforts but many people continued to fill bags because they knew how desperate home owners were to save their homes if able. With an emergency levee system to combat the surging Missouri River completed, residents here awaited further water releases from a dam 75 miles north. 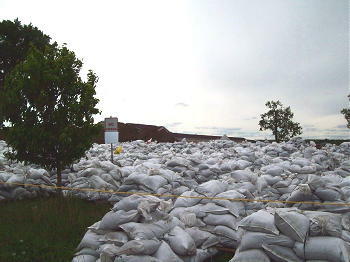 All have been affected, directly or indirectly, by the rising flood waters of the Missouri as the snowcap of the Montana mountain ranges, and the runoff from other rivers and tributaries has sent vast amounts of water down the Missouri River, causing great flooding and threats of flooding down river. In addition to North Dakota and Montana, South Dakota, Nebraska, Iowa, Kansas, and Missouri are also suffering the runoff from heavy snow pack from the Centennial Mountains in Montana, which is the primary source of the Missouri River. 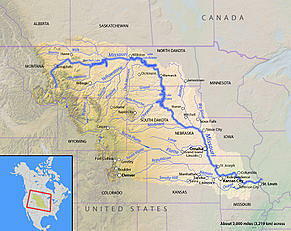 The Missouri, along with 32 other rivers, then feed into the Mississippi, which is also flooding its banks. The Army Corps of Engineers is releasing record amounts of water through Missouri River dams because of heavy spring snowmelt and rain. So far the levies are holding but, today I spoke with a Red Cross Disaster Team worker from Iowa. He said a levy had broken, today, in Iowa, causing even greater damage than Iowa has already suffered. This same Red Cross Team member told me that he has not heard one cuss word or any words uttered in anger since he has been in North Dakota. He said that impressed him. It just makes us proud of our community. I have included the following article from the Burleigh County Commissioner, Mark Armstrong. Bismarck is in his district. He gives an eye witness account of the events unfolding here as the scene changes so rapidly.